Ever since I left the South—as I’ve wandered from New York, across the Midwest, to the Southwest, eventually landing in Califas (interspersed with long stints in Lima)—no matter where I go, I’ve always been confronted by incredulous looks when I tell folks where I spent my childhood: Alabama!? That’s right. Perhaps it doesn’t seem that random to me because we weren’t the only Peruvian family around. In the golden age of the 1980s, peruanos in Birmingham could field two full soccer teams (see photo above) and collectively cook up an enormous buffet table every July 28th, for Independence Day parties. There were lots of us, or at least that’s how I remember it. Still, part of me has always wondered too. Why there? How? Recently, on a trip back, I had the chance to chat with my uncle Hubert and my aunt Mercedes. They were raised in Arequipa, and Hubert and my father were childhood friends. Like my old man, Hubert also studied medicine at the local university. When my father transferred to Lima, they lost touch, and found one another, quite by accident, a decade later in Alabama. When I asked Hubert and Mercedes how this came about, my uncle began with an observation about the university in those days: the old, fusty, boring teachers had all studied in Europe, whereas the good, young, dynamic teachers had studied in the US. Naturally, Hubert began thinking he should come north. Like any good student, he went to the library, where the university kept a green reference book containing the addresses of American universities and a listing of scholarship possibilities in the US open to Peruvians, alphabetized by state. He turned to the first page: Alabama. And that was it. The whole story. At that point in the interview, my aunt started laughing: if only he’d turned a few more pages, she said, we could have moved to California! 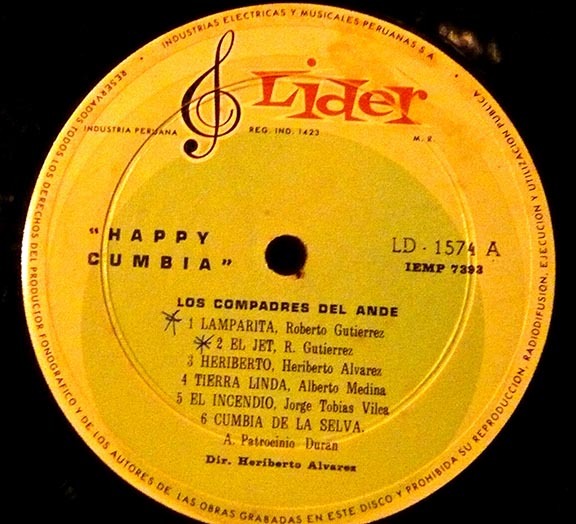 And here’s “El Jet”, a song from Los Compadres del Ande that makes me think of my parents’ generation, the ones that left Peru for all those random places that beckoned. It goes out with much love to my folks, to Hubert and Mercedes, and all the peruanos in Alabama.